ARRL Headquarters Closed on Presidents' Day: ARRL Headquarters will be closed on Monday, February 20, for the Presidents' Day holiday. Headquarters will reopen at 8 AM EST on Tuesday, February 21. We wish everyone a safe and enjoyable holiday! ARRL Website, Store to be Offline: The ARRL website, the ARRL Store, and other functions will be offline during maintenance on Sunday, February 19, within the period from approximately 2 AM until 4 AM EST (0700 to 0900 UTC). We apologize for any inconvenience. Sacramento Valley ARES Section Emergency Coordinator Greg Kruckewitt, KG6SJT, reported this week that Amateur Radio Emergency Service (ARES®) volunteers actively supported communication for the evacuation and sheltering of nearly 200,000 people living below the damaged Oroville Dam in rural California. The dam, on the Feather River east of Oroville, is the tallest in the US. Following a period of heavy rain, a section of the earthfill-embankment dam's spillway eroded, and authorities ordered residents living below the dam to evacuate, in case the dam should fail. Crews have been attempting to fill the eroded area with rock transported by helicopter. On February 14, authorities lifted the mandatory evacuation order, but said it could be re-imposed, if necessary. Residents returning home were advised to remain vigilant, should the situation again become critical, and some ARES activity continues. "Things have really calmed down for now after the mandatory evacuation notice was reduced to an evacuation warning," Kruckewitt told ARRL on February 15. "At this time, only the Butte County ARES group is deployed to the Chico Fairgrounds to support the Red Cross -- possibly through the weekend." The Chico shelter will remain open until the next storms pass. FEMA reported that the Kelly Ridge Powerhouse located below Oroville Dam is flooded and unsafe. "Any further flooding could result in the potential release of 500 gallons of turbine oil stored in tanks," the agency said on February 15. Butte County ARES EC Dale Anderson, KK6EVX, was called out by the emergency operations center (EOC) on the evening of February 12. Six members of the Butte County ARES team have been deployed to the Red Cross evacuation shelter at the Chico fairgrounds. "ARC still wants us at the Chico Fairgrounds," Anderson told Kruckewitt on February 15. "We are down to one VHF unit and one operator on watch for now." On February 12, Yuba/Sutter ARES EC Steve Sweetman, K6TAZ, opened and managed a net to provide information and gather reports of road closures or problems during the evacuation. 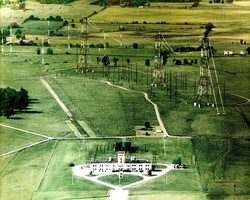 The net received reports from radio amateurs who were evacuating. Traffic was reported to be very heavy, with a trip that would normally take 20 minutes extending into a "3-hour stop-and-go ordeal," Sweetman said. The net also gathered and disseminated information on where evacuees could get fuel. "This became a critical need, as the thousands of people evacuated their houses with 1-hour notice," Kruckewitt said. Sweetman provided shelter for 17 evacuees. The Sacramento County EC Vince Cracchiolo, KI6NHP, was called into the Sacramento County Emergency Operations Center (EOC) on February 13 as the Red Cross opened a shelter at Cal Expo in Sacramento. Kruckewitt said the Sacramento Valley Section received offers of help from hams outside of California. As of February 15, FEMA was reporting 16 shelters open with 2,606 occupants. "All ARES groups in the section are on standby, if help is needed. So far, the dam is holding, and repair work is under way at last report," Kruckewitt said. According to the California Department of Water Resources (DWR), evacuation orders were issued to residents surrounding Lake Oroville late Sunday afternoon. "DWR has been monitoring conditions at Lake Oroville's main and auxiliary spillways around the clock for signs of erosion that could threaten the integrity of the emergency spillway and allow large, uncontrolled flows to the Feather River," the agency says on its website. The FCC has invited comments on the ARRL's January 12 Petition for Rule Making to allocate a new, secondary contiguous band at 5 MHz to the Amateur Service. The League also asked the Commission to keep four of the current five 60-meter channels -- one would be within the new band -- as well as the current operating rules, including the 100 W PEP effective radiated power (ERP) limit. The federal government is the primary user of the 5 MHz spectrum. The FCC has designated the League's Petition as RM-11785 and put it on public notice. Comments are due Monday, March 20. ARRL plans to file comments in support of its petition. "Such implementation will allow radio amateurs engaged in emergency and disaster relief communications, and especially those between the United States and the Caribbean basin, to more reliably, more flexibly and more capably conduct those communications [and preparedness exercises], before the next hurricane season in the summer of 2017," ARRL said in its petition. The League said that 14 years of Amateur Radio experience using the five discrete 5-MHz channels have shown that hams can get along well with primary users at 5 MHz, while complying with the regulations established for their use. "Neither ARRL, nor, apparently, NTIA is aware of a single reported instance of interference to a federal user by a radio amateur operating at 5 MHz to date," ARRL said in its petition. NTIA -- the National Telecommunications and Information Administration, which regulates federal spectrum -- initially proposed the five channels for Amateur Radio use. In recent years, Amateur Radio has cooperated with federal users such as FEMA in conducting communication interoperability exercises. The WRC-15 Final Acts stipulated a power limit of 15 W effective isotropic radiated power (EIRP), which the League said "completely defeats the entire premise for the allocation in the first place." ARRL said the FCC should permit a power level of 100 W PEP ERP, assuming use of a 0 dBd gain antenna, in the contiguous 60-meter band. "To impose the power limit adopted at WRC-15 for the contiguous band would render the band unsuitable for emergency and public service communications," the League said. 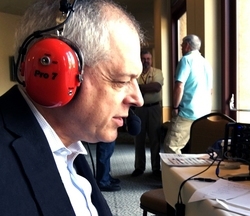 ARRL Public Relations Committee Chairman Scott Westerman, W9WSW, believes collegiate Amateur Radio clubs need to blow away the dust and cobwebs and modernize, in order to attract new members. And he urges college and university ham radio clubs to seek common technological ground with younger generations, in order to attract new Amateur Radio licensees. ARRL PR Committee Chair Scott Westerman, W9WSW, operates W1AW/0 at the 2016 ARRL Rocky Mountain Division Convention (HamCon). "We really need to be thinking in terms of...state-of-the-art technology, because that's what 'the kids' are looking for nowadays," Westerman told ARRL Marketing Manager Bob Inderbitzen, NQ1R, during a brief interview at the 2017 Orlando HamCation February 10-12, which hosted this year's ARRL Southeastern Division Convention. "The big challenge is how to get them away from their cell phones." Westerman, a Michigan State University (MSU) alumnus and executive director of the MSU Alumni Association, recalled his own student days, when MSU Amateur Radio Club (MSUARC), W8SH, had a Collins S-Line for a station. Founded in 1919, the MSUARC is one of the oldest collegiate ham clubs in the US. Collegiate clubs need to tap into students' interest in "parallel" technological realms, such as the Maker movement or those already experimenting with electronics, Westerman said. "At one time or another, we were all in that parallel universe, and there was something that brought us to ham radio," he offered. Westerman said the MSU club has come up with a program to get students on HF via a remote base. "So, you can get into our state-of-the-art shack, you can check out a control head, a Kenwood TS-480, take it back to your dorm, plug it into the Wi-Fi network, and work the world!" While access to opportunities for getting on the air is important, Westerman said, the availability of Amateur Radio mentors -- what he called "our seasoned generation" of radio amateurs -- is also vital. "We're trying to encourage them to reach out and adopt somebody, and to do the same for them that somebody did for us." For Westerman, that person was his uncle, who took him into his ham shack and got him fascinated with the world of Amateur Radio. "Why can't we be one of those people for some kid in college?" he suggested. "That's the challenge." The ARRL College Amateur Radio Initiative (CARI) enjoyed attention throughout HamCation, Inderbitzen recounted. ARRL CEO Tom Gallagher, NY2RF, wearing a "Penn" sweatshirt for his University of Pennsylvania alma mater, welcomed attendees to a Collegiate Amateur Radio Initiative Forum, moderated by Andy Milluzzi, KK4LWR. A graduate student in electrical engineering, Milluzzi highlighted the value of Amateur Radio as a way to meet other people. The High Frequency Active Auroral Research Program (HAARP) in Gakona, Alaska, will soon undertake its first scientific research campaigns since the facility was taken over by the University of Alaska Fairbanks (UAF) Geophysical Institute 18 months ago. 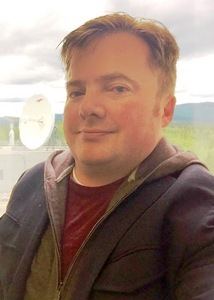 Among the investigators is UAF Researcher Chris Fallen, KL3WX, who will be working under a National Science Foundation grant, "RAPID: Spatiotemporal Evolution of Radio-Induced Aurora." Fallen says the HAARP transmissions will take place within the facility's transmitter tuning range of 2.7 to 10 MHz and should be audible outside of Alaska, and may even produce visible effects within the state. Part of the vast HAARP antenna array with the control center in the background, set against the majesty of the Alaska landscape. "This time my experiments will largely focus on artificial radio-induced airglow that potentially can be photographed from nearly anywhere in Alaska -- weather permitting," Fallen told ARRL. "I plan to start and stop each experiment block with an audio Luxembourg-style broadcast -- transmitting two amplitude-modulated carrier waves at different frequencies separated by about 1 MHz, with the resulting skywave signal being a mix of both frequencies." Fallen's experiments will take place February 19-22. Fallen said that he has prior success reproducing the "Luxembourg effect" using two DTMF tones. "But this time, I have a short, simple musical composition recorded by a local musician," he said. "It was composed specifically to take advantage of the Luxembourg effect." According to UAF, Fallen, an assistant research professor in space physics, will create an "artificial aurora" that can be photographed with a sensitive camera within Alaska. The phenomenon has been created in the past above HAARP during certain types of transmissions. Just which HF frequencies Fallen will use won't be determined until shortly before he begins his research. "The specific frequency chosen during a particular experiment depends on the experiment's objectives, FCC regulations, and ionospheric conditions at the time," Fallen explained. He will use ionosonde data to guide frequency selection. In his explanatory Gakona HAARPoon 2017 blog, Fallen explains that HAARP scientists use the ionosonde to estimate two important parameters: (1) the amount of low-level ionosphere D-region HF radio absorption that frequently occurs due to natural, but not well understood, processes that prevent HAARP radio wave energy from reaching the higher ionosphere E and F regions; and, (2) the ionosphere vertical "critical frequency" [sometimes referred to as foF2], above which any radio transmissions pass through the ionosphere into space rather than being reflected or absorbed." 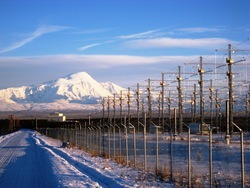 Built and operated by the US Air Force until August 2015, HAARP includes a 40-acre grid of antennas and a very high-power array of HF transmitters to conduct ionospheric research. Later this month, scientists will use HAARP to conduct other experiments that will include a study of atmospheric effects on satellite-to-ground communications and over-the-horizon radar experiments. Research funding agencies also include the US Department of Energy's Los Alamos National Lab and the Naval Research Laboratory. HAARP also has a Facebook page. 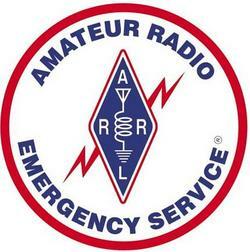 The Amateur Radio Emergency Service (ARES) has posted its 2016 annual report. The 2016 ARES Annual Report focuses on documenting the value that ARES provides to the nation, states, and localities in collaboration with partners at all levels. The report features basic data drawn from Section Emergency Coordinators' reports, a breakdown of ARES figures by state and FEMA region, and a challenge for 2017. According to the report, ARES membership in 2016 was 27,754 -- up from 17,756 in 2015 -- and the Service was active in 42 states and US territories. ARES volunteers responded to 33,136 events last year. "Sharing information about what ARES provides at all levels is critical to our work overall, as hard numbers provide better detail about our work," ARRL Emergency Preparedness Manager Mike Corey, KI1U, said. "We all need to pitch in to ensure that our contributions are counted, and here at HQ, we will be sure to do our part." ARES volunteers will see changes in some reporting forms in 2017; all forms, starting in January 2017, have been updated and renumbered. According to the report, 76% of ARRL sections filed reports for 2016, a significant improvement over past years. The report challenges ARRL Section Emergency Coordinators to raise that number to 85% in 2017. In addition to the annual ARES report, ARRL Field Services staffers will produce their own monthly report, a link will appear in the ARES E-Letter, showing monthly data for ARES, as well as information about ARRL Headquarters emergency preparedness and Field Service activities. AMSAT-UK reports the Indian Space Agency (ISRO) on February 15 successfully launched the Nayif-1 Amateur Radio CubeSat, along with 103 other satellites -- a record for a single launch. The Nayif-1 1U CubeSat includes a full FUNcube communication package. Nayif-1 carries a U/V linear Amateur Radio transponder for SSB and CW and a telemetry transmitter. Nayif-1 started transmitting about 1 hour after launch, and radio amateurs on the west coast reported the first signals. Nayif-1 is a joint project of the Mohammed Bin Rashid Space Centre (MBRSC) and American University of Sharjah (AUS). 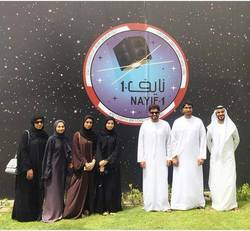 The United Arab Emirate's first nanosatellite, Nayif-1 was developed by Emirati engineering students from AUS under the supervision of a team of engineers and specialists from MBRSC. The partnership between the two entities was aimed at providing hands-on satellite-manufacturing experience to engineering students. Telemetry is transmitted on 145.940 MHz, 1.2 kb BPSK (FUNcube standard). The SSB/CW transponder uplink passband is 435.045-435.015 MHz, and the downlink passband is 145.960-145.990 MHz. A mission-specific telemetry dashboard is available. In a manner similar to that of the FUNcube-1 dashboard, this one will be capable of uploading the telemetry received to a central data warehouse. More information on the telemetry dashboard is available, as is a test file. Initial spacecraft operation will be in a low-power "safe" mode, with just the telemetry transmitter activated. The International Amateur Radio Union Region 1 (IARU-R1) Monitoring System newsletter reports a mysterious "foghorn" -- a Chinese over-the-horizon (OTH) burst radar -- is operating in Amateur Radio bands. "We observed the mysterious foghorn on 7, 10, and 14 MHz," the newsletter recounted. "This is a Chinese OTH radar, which is often jumping, and sounding like a foghorn." The signal is frequency modulation on pulse (FMOP) with 66.66 sweeps-per-second bursts. 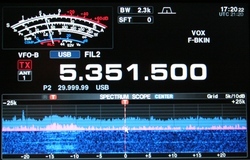 Other intruders include a Russian frequency shift keying (FSK) signal from Kaliningrad on 7,193 kHz and a Russian FSK signal on 7,193 kHz (50 baud, 200 Hz shift). German telecommunications authorities have filed another complaint. The latest IARUMS newsletter also reports strong splatter from Radio France International (RFI) on 7,205 kHz down to 7,186 kHz. The French REF has informed RFI and French telecommunications authorities. Intruders still reported, and the subjects of complaints from German authorities include Radio Hargeysa in Somaliland on 7,120.0 kHz; Radio Eritrea with Ethiopian interference on 7,175.0 kHz; Radio Taiwan and a Chinese jammer on 7,200.0 kHz, and a Radio Tajik harmonic (from 4765 kHz) on 14,295.0 kHz. The VOA-Bethany station in West Chester, Ohio, now a museum. transmitted into Germany from a small studio in New York City. Introduced by "The Battle Hymn of the Republic," the voice of announcer William Harlan Hale declared, "We bring you Voices from America. Today, and daily from now on, we shall speak to you about America and the war. The news may be good for us. The news may be bad. But we shall tell you the truth." "We're planning a series of events and exhibits this year to celebrate the VOA's commitment across America and the world to embrace best practices in telling the truth in order to let the world decide," said Jack Dominic, the museum's executive director. The West Chester Amateur Radio Club is a museum partner and operates WC8VOA from the museum. At the dedication of VOA-Bethany, FCC Commissioner Clifford Durr referred to the forest of towers on the site as "siege guns of radio...that can hurl explosive facts against the enemy's weapons of lies and confusion... They are also potential guns of peace." Helped by an array of rhombic antennas, VOA-Bethany station transmitted news to Europe during World War II and to South America during the Cold War. The federal government decommissioned the Bethany station in 1994. Siege guns: VOA-Bethany's six transmitters were connected to dozens of large antennas spread across a 1-square-mile area. Many people may recall seeing these towers as they drove past on Interstate 75. "The men and women who made up the VOA broadcasting system were our journalistic beacons of light during the 20th century," said Ken Rieser, president of the VOA Museum board. "Elmer Davis, John Houseman, Edward R. Murrow, and Robert Bauer all had positions of leadership within the VOA." Today the VOA is the world's largest international broadcaster, transmitting news and information in 47 languages to 236 million people each week, according to the VOA website. 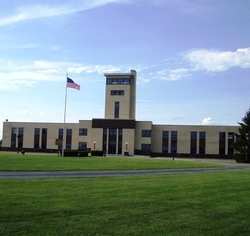 The National VOA Museum of Broadcasting, located in the art deco Bethany station building, houses three collections -- the Gray History of Wireless radios, VOA-Bethany station's Voice of America control room, and the Media Heritage Cincinnati Museum of Broadcast History. The National VOA Museum of Broadcasting is open on the third Saturday of each month -- including February 18 -- from 1 to 4 PM Eastern Time. For more information, visit the VOA Museum website. Field Day 2017 Packet is Now Available: The Field Day 2017 packet now is available from the ARRL website. Field Day 2017 is June 24-25 -- always the fourth full weekend in June. There have been no significant rule changes from 2016. The Field Day packet contains everything you or your club will need to succeed in June, including explanations, FAQs, articles from experts, and even a log page template, if you log on paper for FD. For more information on Field Day, contact the ARRL Contest Branch. New Section Manager Appointed in Illinois: Ron Morgan, AD9I, of East Peoria, Illinois, has been appointed ARRL Illinois Section Manager, effective February 16. He succeeds Tom Ciciora, KA9QPN, of Sandwich, who stepped down for personal reasons. ARRL expressed its thanks to Ciciora, who has served at the helm of the Illinois Field Organization for more than 10 years, since July 2006. ARRL Field Services Manager Dave Patton, NN1N, appointed Morgan in consultation with ARRL Central Division Director Kermit Carlson, W9XA. Morgan, who has been an Assistant Section Manager in Illinois since 2002, will complete the current term, which continues through June 2018. He's also a Central Division Assistant Director. 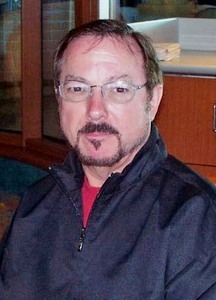 A retired electrical engineer, Morgan currently teaches technology at Illinois Central Christian School. Tad Cook, K7RA, Seattle, reports: Over the February 9-15 reporting week, the average daily sunspot number declined from 21.3 to 17.6, while the average daily solar flux rose from 73.5 to 75.1. The average planetary A index dropped from 12.9 to 4.7, and the mid-latitude A index dipped from 9.9 to 2.9. 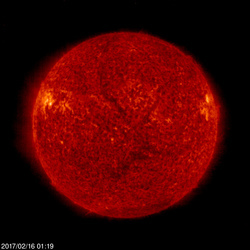 The predicted solar flux is 75 on February 16-17; 74 on February 18-19; 77, 80, and 83 on February 20-22; 80 on February 23-24; 78 on February 25-26; 76 on February 27-28; 75 on March 1-2; 73 on March 3-4; 72 on March 5-7; 73 and 74 on March 8-9; 75 on March 10-11; 78 on March 12-15; 80 on March 16-18; 82, 85, and 82 on March 19-21; 80 on March 22-23; 78 on March 24-25; 76 on March 26-27, and 75 on March 28-29. Predicted planetary A index is 10, 12, 10, and 8 on February 16-19; 5 on February 20-21; 8 and 15 on February 22-23; 10 on February 24-25; 5, 25, 30, 25, and 20 on February 26-March 2; 15 on March 3-5; 8 on March 6; 5 on March 7-12; 8, 12, and 10 on March 13-15; 8 on March 16-17; 5 on March 18-20; 10 and 15 on March 21-22, and 10 on March 23-24. Sunspot numbers for February 9 through 15 were 15, 18, 18, 18, 16, 15, and 23, with a mean of 17.6. The 10.7-centimeter flux was 75.4, 74, 75.7, 76.2, 74.8, 74.5, and 74.8, with a mean of 75.1. Estimated planetary A indices were 7, 8, 5, 3, 5, 2, and 3, with a mean of 4.7. Estimated mid-latitude A indices were 5, 5, 3, 2, 2, 1, and 2, with a mean of 2.9. The February 9 edition of The ARRL Letter included an error in the title of the QEX article for which Steven J. Franke, K9AN, and Joseph H. Taylor, K1JT, were awarded with the Doug DeMaw Technical Excellence Award. The article, which appeared in the May/June 2016 issue of QEX, was entitled, "Open Source Soft-Decision Decoder for the JT65 (63, 12) Reed-Solomon Code."